Polar ice loss: Antarctica melting faster, Greenland more vulnerable. Antarctica is losing land ice faster than previously measured; areas shown in red to black are losing more than a meter of surface ice per year. The ice at the Earth’s poles plays a critical role in our environment. It’s the largest store of fresh water on the planet, and as it melts it affects ocean height, temperature, and circulation … which in turn changes our weather and, in the long term, our climate. It’s why scientists study that ice so carefully, and why we’re getting more news about it lately. Unfortunately, that news is bad. And now it’s getting worse. 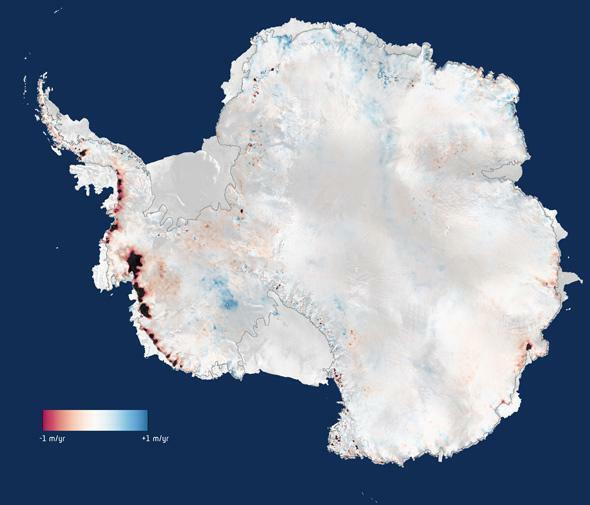 Bad News the First: CryoSat, a European Space Agency Earth-observing satellite, has found a sharp increase in the rate at which Antarctic land ice is melting—it’s losing a staggering 159 billion (yes, billion, with a b) tons of ice every year. Previous measurements (made from 2005 to 2010) were lower, closer to 100 billion tons per year. The use of CryoSat has made a big improvement in the ability to measure Antarctic ice; it covers 96 percent of the continent (to within a couple hundred kilometers of the pole), and gets far better observations of the coastline too. The new results show that most of the loss of ice is coming from West Antarctica, where a recent study showed the eventual collapse of the glaciers there is inevitable. Fully 134 billion tons of ice melts just from that location every year, with the ice thinning by 4-8 meters where it meets the water. These new measurements show that the southern continent alone is responsible for a 0.45 mm rise in sea level every year. That’s pretty sobering. Oceans are big, so even half a millimeter per year is a vast amount of water. But wait! There’s more. A lot more. Bad News the Second: Greenland is more vulnerable to melting that previously thought, and it turns out the culprit is the same as for Antarctica: warming ocean water. In Antarctica, warm water gets underneath glaciers as they flow into the sea, thinning them and making them more susceptible to melting farther inland. In Greenland, though, the water laps up against vertical cliffs, melting the ice there. However, scientists thought the melting would slow as glaciers retreated to higher ground, where the warmer water wouldn’t reach. It turns out, though, that new observations using radar to map the topography of the rock under the ice show that there are deep valleys that extend inland, and the warm water will be able to use that as an avenue to access more ice. That means that the melting won’t stop as the water moves inland. Scientists estimate that half of the glaciers could melt, reducing a huge percentage of the ice sheet over the rock. Greenland already contributes significantly to sea level rise. It looks like that will continue for quite some time. 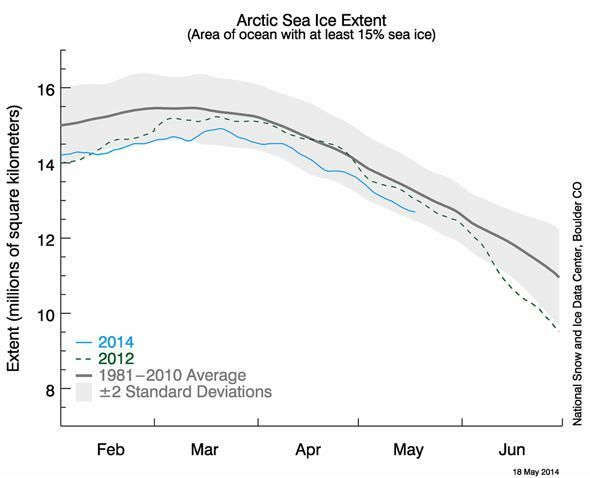 Bad News the Third: Arctic sea ice loss continues apace. It reached a record low extent in 2012, and this year the amount of ice has been consistently below the amount of ice in 2012 for the same day and month. I’ll note that in 2012 there was an unusual event; an ice dam collapsed, allowing the melting of a large amount of ice. That’s why the year broke the record. But, despite the unending deceptions from the deniers saying arctic ice “recovered” in 2013, it is in fact still far, far below average, and the overall trend over time is for more loss. Arctic ice extent (similar to area covered) for 2014 (blue line) compared with 2012 (dashed line) and the 1981-2010 average (gray line). Why is this important? For many reasons, but the scariest is sea level rise. Over long periods of time that means we’ll lose coastline and coastal cities. But in the short term it also means more damage via flooding, especially as powerful storms sweep water inland with them; storm surges will increase in devastation. Bad News the Fourth: Shocking to absolutely no one, as the real news has gotten worse the deniers have kicked into high gear, making ever more noise in the hopes of distracting people. The latest fauxtrage is over a research paper that was rejected by a journal; the paper claimed the environmental sensitivity to carbon dioxide was lower than currently projected; in other words, we won’t get that much hotter even if CO2 increases. The paper, however, was rejected for “factual errors” and “significant flaws”; problems that routinely result in the rejection of a paper for publication. So of course the deny-o-sphere has tried to make this about politics, saying a reviewer rejected the paper because it would make it easier for deniers to mislead people. This claim is obviously ridiculous, as you can read on Climate Consensus and an article in the Guardian. There are lots of details in DeSmogBlog, too. The idea that this is “climate McCarthyism” is also transparently wrong. The real facts are and have been coming in for a long time now. Our temperatures are rising, the ocean water is warming, our poles are melting, and sea levels are creeping up. We need to kick the deniers to the curb, and start working on real solutions.